One of the best lessons that parents can teach their children is that you don't need to be the same as everyone else in order to fit in. Have you seen many jigsaws where all the pieces were the same shape and size? It's the diversity of the human race that adds to our unique beauty and individuality. It's what makes us special and that is the message that we need to communicate to our children. Everyone is different, but problems can arise when a child feels that everyone else shares a common trait that they don't. 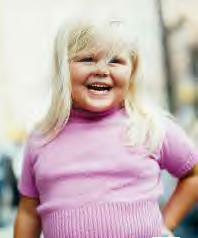 The larger child, for instance, can feel isolated because they perceive everyone else as slim and feel that they are less valid as a person because they are made to feel uncomfortable about their size, often by insensitive taunts from other children who make unkind references to their weight as though it is something of which to be ashamed. When my eldest son was 14, he gained a lot of weight and I recall how distraught he was when a couple of insenitive and callous individuals who used to frequent our household referred to him as "Lard" rather than his real name of Kristian. Feeling different can batter some children's self-esteem, whereas others view it positively and build on their individuality to become great achievers. A lot depends on the child's individual personality, but there are techniques that every parent can employ to help nourish and elevate a child's self-esteem and confidence. Touch is the first sense to develop and this is the first way that infants begin to learn about the world around them. One of the best ways to bond with your baby and begin the self-esteem building process is through infant massage, but this is also a time to interact verbally with your baby. Emma Miller, D.Div, Child and Family Specialist and creator of the ¹Gentle Touch® Program advises asking your baby for permission before touching her. Whilst a parent may feel that it is his or her right to touch a baby of their own, they are not considering the wishes of the baby. Emma says, "Remembering that infants are highly interactive from the beginning is an important part of not taking them for granted". When you ask your baby for permission to touch her, it encourages and teachers her to respond and makes her feel important and needed. "This is the foundation for healthy self-esteem and the ability to be honest with herself and her feelings", says Emma. In general, the higher a child's self-esteem, the more competent they are at dealing with the unpleasant situations that life deals and that includes other people's attitudes towards them. An overweight or disabled child, for example, will be more capable of dealing with cruel taunts from unkind children and will still be able to maintain a sense of self-worth, irrespective of any insensitive jibes that are thrown at them. The higher a child's self-esteem before adolescence, the more adept they will be at coping with negative peer pressure. Despite the numerous "big is beautiful" campaigns, promoting the interests of the larger person, the media continues to glamorise thinness and represent larger people as objects of ridicule. Unfortunately, children are very much influenced by what they see and hear, not only on the TV and in magazines, but also from the mouths of adults, including their parents. If a child hears their parents referring to someone's size in an unkind way, they grow up believing that being fat is socially unacceptable. How sad it is, therefore, if such children end up struggling with their own weight or don't conform to the "rake thin" ideal. The way is simply being paved for potential eating disorders, self-image problems and low self-esteem. In fact, many children will go through periods where they seem to be growing outwards rather than upwards and yet many of these may end up as slim, strapping six footers. However, the emotional scars that were formed as tubby youngsters may remain with them for life. In fact, the body needs fat to survive and it is as harmful, if not more, to be underweight than it is to be overweight. There are many larger children who are popular and outgoing individuals who have recognised that personality, talent and likeability isn't shaped by size. Acceptance builds self-esteem and when parents accept their children, they learn to accept themselves and in turn will be accepted by others. If a parent makes cruel references to a child's size, he may become withdrawn, insecure and anxious and lack the confidence to make friends. After all, if a child cannot accept himself because his parents object to his size, how can he expect anyone else to accept him? Being overweight is not a crime, but if you feel that your child has a serious weight problem and are concerned about his or her health, there are steps that you can take to help the situation without forcing the child into uncomfortable eating or exercise regimes. Substituting high-fat foods for lower-fat options without changing drastically changing the diet can significantly reduce your child's calorie intake. Encouraging your child to be more active by engaging in fun activities as a family, rather than a competitive team sport, will not only boost his metabolism and improve his fitness levels, but may interest him in new pursuits where he may feel a sense of achievement, which in turn boosts self-esteem. "Yes, I might not be skinny, but at least I have a good heart and I don't judge other people by the way they look. You, for instance, have got big ears and yet I'm sure that doesn't change the person that you are inside, nor make you any more sensitive to other people's feelings." It has always seemed bizarre to me why someone should be made to feel different or is ostracised simply because they have a higher level of pigment in their skin, or were born into a different religion. Nevertheless, racial bullying exists and, as with other types of abuse, it can have a devastating effect on a child's self-esteem. However, it is important for the child to understand that any difference in any culture can be the basis of prejudice. 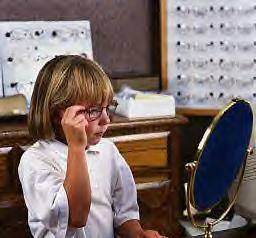 A white child may be teased by other white children because he wears glasses, or is perceived to be stupid, or has elderly parents, divorced parents or does not live up to the ideal of a particular group at a particular time. The way in which we often try to feel good about ourselves is by focusing on comparisons with our peer group. If we possess a quality or skill that we feel is good, then we prefer to think that it is unique or that there are not many others with the same feature or talent. However, if we possess a quality that we do not feel is a positive attribute, then we prefer it if we know that there are many others like us. Therefore, if a child feels that having a different colour skin to the rest of his friends is not an advantage, then he or she is more likely to be negatively affected by any taunts that are directly related to his race. If your child is upset by unkind taunts about her colour, you could point out that if being coloured is so unappealing, then why do so many white people fry their bodies in the sun every summer in pursuit of darker-coloured skin? Teach her to be proud of who she is, her uniqueness as a person and her personal talents. Everybody has them. 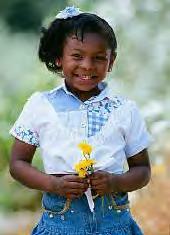 exposing them to cultural diversity from an early age, will help them to deal with prejudices when they are older. There is a fine line between protecting and stifling. If a child is born with, or develops a disability, it is extremely important for the parents not to over-protect the child, which can make the child feel that she is different in a negative way. A Spina Bifida sufferer I know, for example, told me about the isolation that she felt as a result of her parents' overprotectiveness. She said, "Although I was an outgoing person and had no problems making friends, my parents never allowed me to join them on outings or social events because they were afraid of something happening to me. As a result, my friends eventually stopped inviting me to take part in group activities and that was a dreadful blow to my self-esteem. Personally, I didn't view myself as any different to say, someone who was short-sighted or someone with eczema. Nobody's perfect, so who's to say that my disability puts me at more of a disadvantage to anyone else? I also think that my parents thought I would be a burden on the others and they didn't feel it was right to put the responsibility for my welfare in their hands. Being made to feel that you are a burden on others totally saps your confidence and feelings of self-worth." 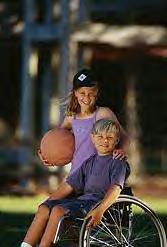 Parents can boost a disabled child's esteem enormously by helping them to lead as normal a life as possible and to allow them to make their own choices, difficult as this might be. They should also not ignore bad behaviour or make excuses for a child if she has acted in an unacceptable way. Respect and courtesy is something that should be exercised by everyone, irrespective of their circumstances, even disability. An undisciplined child will inevitably grow up with poor self-esteem. He will encounter rules and regulations outside of the home environment and will find it very difficult to conform if his parents have not regulated his behaviour. The undisciplined child will probably have no respect for his parents, let alone anyone else and particularly not those in positions of authority. As a result he will often find himself in trouble and the resultant chastisement will lower his self-esteem further. Parents who allow their children to do as they please and who don't reprimand them for bad behaviour are not being kind. On the contrary, they are mapping out a life of difficulty for their offspring, with the likelihood that the child will encounter disapproval wherever he goes because of his inability to respect, nor understand, rules and limits. Naturally, discipline has to be adapted according to the age of the child. A two-year-old, for example, cannot be disciplined in the same manner as a teenager because their powers of understanding are vastly different. A toddler will only just be grasping the concept of right and wrong, whereas a teenager should (in theory) have a clear understanding of what is and isn't acceptable behaviour. Continual praise builds self-esteem, right? Not exactly, no. Whilst it is important to let children know that they are appreciated by recognising effort and achievement, overpraising a child for everything that they do can end up becoming meaningless. They may learn to stop trying because they know that their parents think that everything they do is wonderful, which is laying the foundations for eventual failure. They may become dependent on constant praise for motivation and may end up not achieving anything in life as a result. Parents should encourage their children to capitalise on their individual strengths, help them to learn new skills, give praise where praise is due and teach them to accept their weaknesses without viewing them as failings. Effort and achievement should be encouraged, but without pressuring the child to do well. Every child's personal best is different and each child should be praised according to the effort that they have put in. A child who comes last in a school sports' day race, but who has given their best, deserves as much praise as the natural born athlete who wins the race. It is also important to teach your child that coming last does not mean failure and that it's perfectly normal to make mistakes. The child who believes that is more like to have high self-esteem than the child whose parents have taught him that it is wrong to fail, or that winning is most important. Parents whose expectations of their children are too high will not encourage healthy self-esteem. "Where talent is a dwarf, self-esteem is a giant."